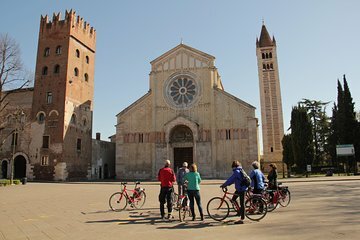 Conheça a cidade histórica de Verona desde o início com um passeio de bicicleta de 3 horas. Navegue pelos belos bairros de ruas de paralelepípedos com o seu guia experiente para ver as principais atrações e joias escondidas. Pare ao longo do caminho para provar sorvete, vinho e alguns pratos típicos locais. Myself and my boyfriend love discovering new cities in different ways and the highlight for us within Verona was this bike tour!! we were only in Verona for a day so we really wanted to do something different and so decided why not on a bike! We arrived within the bike shop to see our bikes were all ready and waiting for us I had a handbag with pretty much my life in it but the bikes have these very secure pouches that held it so securely was chuffed! It turned out that it was just me and my boyfriend for the tour which suited us perfectly! Our guide was Ana prepped us before we set out on some of the history of Verona and what to expect and this was so useful to see all the old maps and visualize how it all would have looked. Ana was amazing throughout the trip could not praise her more on the places we went to see and as me and boyfriend were not completely used to being within a city on bikes she guided us safely though everywhere we went and always checked to make sure we were safe! The tour was such a highlight for us and would super urge people to do it! it was just amazing!!!! Thanks again Ana!!! We loved our 3-hour biking tour around Verona with Simonetti Tours! It was a great way to see the town and learn the lay-out. We stopped at the major landmarks and there was time for photos. Our tour guide, Angelo? was outstanding! As a native of Verona, he was very knowledable about the town and its history. He was also very funny and ensured we all had a great time. In 95-degree heat, that was no small task. When selecting our bikes, Simonetti worked hard to make sure we had the appropriate bikes for our height. Definitely recommend! Very relaxed and interesting tour of amazing Verona. The bikes were in very good conition, Our guide Arcangelo was very nice and showed us places you usually would not visit, gave us diffrent views and a great overview n historic buildings and history of Verona - but not too much, there was also time to just enjoy the ride. Very good hints for nice bars away from the touritss spots. Best thing to do! What a great way to see the city, bikes were in great shape, the guide was knowledgeable and enthusiastic. The bike tour made Verona one of our favorite cities to visit in Italy.